Platinum Digital Video is not a big ole' production company with offices. I work out of my 850 square foot home (I call it my sweet cottage) in Gainesville's historical, Duckpond, and run the whole business from the desk in my living room. Yep. As necessity is the mother of invention... I have found these days that necessity is also the mother of new passions. My current passion is researching minimalism, trying to furnish and decorate the house with simple beauty in an attempt to create a comfortable and inspiring living space for my family. (I just want everyone to be happy). It is not just having a small home that feeds the urgency of organization and minimalism, I also have a teenager with autism. I learned at a CARD conference a few years ago, that children with autism need structure and organization more than the average kid. And so my tendency to be an archaic and whimsical person (messy), has been reigned in big-time by my greater need to be a good mother to my 3 children. This year my other two children who do not have autism, were both diagnosed with PANS (one had much more severe symptoms than the other). PANS is basically autoimmune encephalitis. It is a chronic condition and the symptoms are very hard. We have been able to treat both children successfully with long term antibiotics, but we don't know when they will be able to stop the antibiotics and not relapse. Thankfully, at this point, things are back to a normal that I craved at the lowest points. So I have 3 amazing children, a supporting and loving husband, 2 cats, a crazy dog who digs holes in the yard throughout the day then bounds into the house full of dirt, and a thriving video business...all packed into a tiny house. Our lovely life-mess must be gathered and arranged into something very organized and controllable in the best way possible...and here is what I have done thus far to achieve this attainable goal. 1. HELP MYSELF: To be completely honest... the devastation of a watching a child go through PANS, can induce PTSD in the parents. So my first order of business was to get myself straightened out. I worked with my doctor and researched the best vitamins to take, and also started an exercise/meditation routine to beat the stress. 2. ORGANIZE THE BUSINESS: After a year of healing sick kids, filming weddings, editing...editing...editing, ordering new amazing video equipment while tripping over old clutter....I looked around at our life with clear eyes and a full heart, and saw that I needed to take the overstuffed pot off the burner for a while. My immediate, top priority was to get all the weddings we had filmed...edited. So I announced on my website and Facebook page that this year, Platinum Digital Video is not taking any other weddings until 2018. Now I am focusing all my time and attention on the weddings I have on my computer that need to be edited and finished. 3. BUDGET: It felt very responsible and liberating to stop taking new weddings for the rest of this year, but it also meant that I was left with a new life-project plopped in my lap. This project was to ensure that our large and busy family lived off a strict budget. We were used to getting drinks and deserts with meals at restaurants, going a little nuts on Amazon after midnight then being like, wait what is this cool present?... when the package arrived. This lifestyle had to change. I now have a Passion Planner, and I write in it daily and keep notes of everything we spend and make sure that we do not spend more that we have coming in for the month. I use the PDF spending tracker inserts from the Passion Planner website. This is the first month of our new budget and we will come in on target! 4. ORGANIZE THE HOUSE: I needed the house to be clean and organized for the kids to heal and thrive. So after much research starting with the ever-popular, Life-Changing Magic of Cleaning Up, to Apartment Therapy (how to create beauty and efficiency in a small space), to only having 33 items in the closet at once...I was able to organize a plan and mark it all down in my Passion Planner through "Roadmaps". The clothes for all 5 of us were either given away to charity or stored away, except for 33 items each (not including socks and underwear). I gave away tons of books to the library and we even cleaned out the cobweb-laced laundry-shed and hung cute lights in the back yard. We now are clutter-free enough to live well and that is amazing. But it is an ongoing process. 5. FOOD: During my research about autism and PANS I learned that the stomach is "the second brain". Autoimmune disorders are aggravated by foods that cause inflammation like...you guessed it...gluten to start with and the list goes on. My youngest is newly allergic to wheat and my oldest is hypoglycemic and can't have sugar without equal or more amounts of protein to offset the side-effects... sooooo, our daily eating habits needed attention and organization. 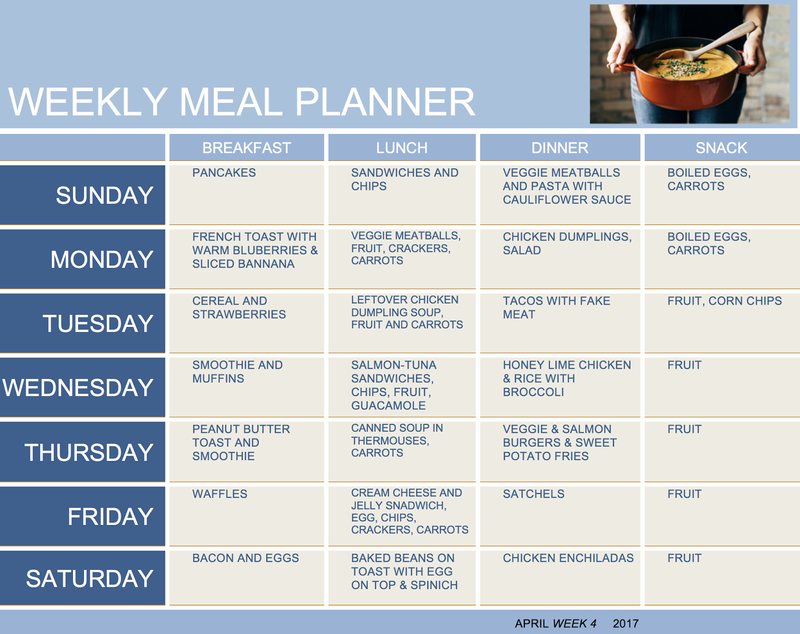 We went from not really knowing what meals we were going to eat from one day to the next, eating out all the time and grabbing takeout... to a spreadsheet-schedule of what would be for breakfast, lunch (including school pack-lunches) and dinner. GF breads and fresh, organic, low/no-sugar foods became the new norm. This lead me to discover, A Pinch of Yum, which is a perfect website full of really delicious recipe's with lots of gluten free options. Also, I had no idea until I read her blog, that the author lost her baby a year ago. This was yet another reminder that everyone is dealing with something...and to always be kind. I found myself feeling grateful for not only her great recipes, but for her openness in sharing something so important and personal. I have the best job ever and can't wait to get back to filming next year. A HUGE thank you to my amazing brides and their families who are so great to work with. Please let me know if you have any secrets to home/life organization or meal plans!